Yes, transcription is still a thing. However, that’s not all that we do; We provide end-to-end solutions that tell your patient story. 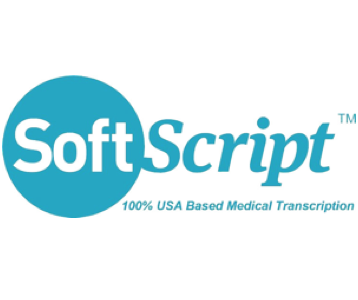 For over 20-years, Softscript, Inc. has led the industry in providing the absolute best in responsible full-suite documentation solutions. Superior quality, done right the first time, provides peace of mind that your documentation will contribute to the delivery of outstanding patient care while achieving accurate reimbursement. Additionally, SayIt™ front-end technology eliminates time consuming training cycles while relieving hospital IT staff from the burden of troubleshooting and maintaining expensive infrastructure. This cloud-based software supports all major medical specialties and is compatible with all EHRs, across all platforms; no installation or integration required. 100% USA-based with a proven and stable record of success, it is no wonder that health systems are relying less on brand recognition and more on qu ality of product, service, and long-term revenue solutions. It’s time to slay the dragon and SayIt™ better with SoftScript.